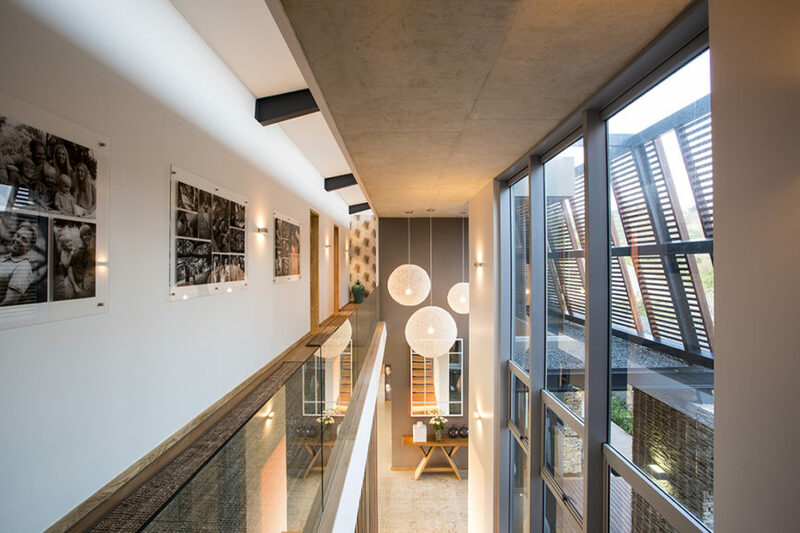 Gallery featuring pictures of the Albizia House by Metropole Architects. 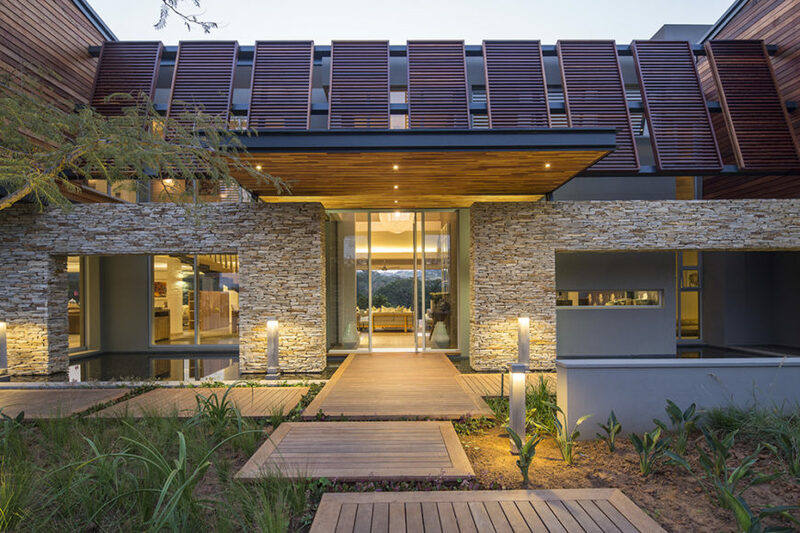 A Wraparound glass facade and rich woodwork highlight this modern home. 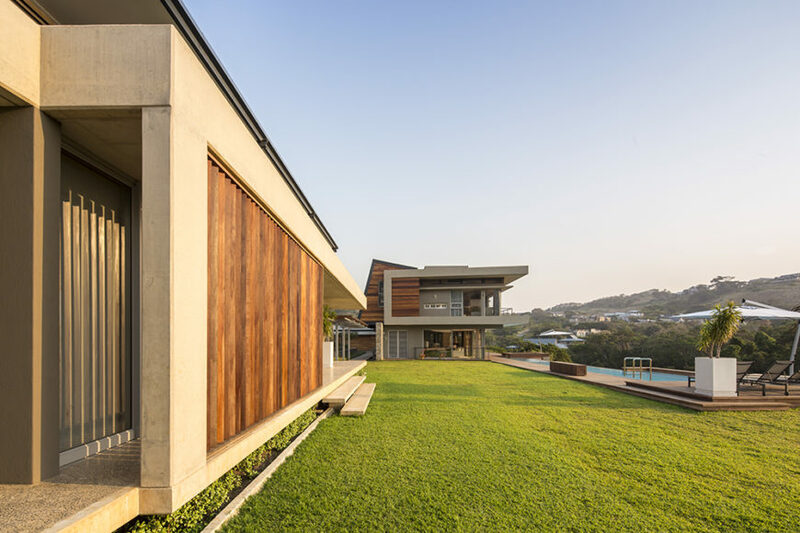 Welcome to our gallery featuring the Albizia House by Metropole Architects. This home features a stunning array of rich materials and cogent modern design over a sprawling 1000 square meter floor plan. The entire building is wrapped in full height glass for a truly innovative indoor-outdoor experience. The first thing anyone notices upon approaching the home is the bold, full height openings across the expanse of the rear facade. 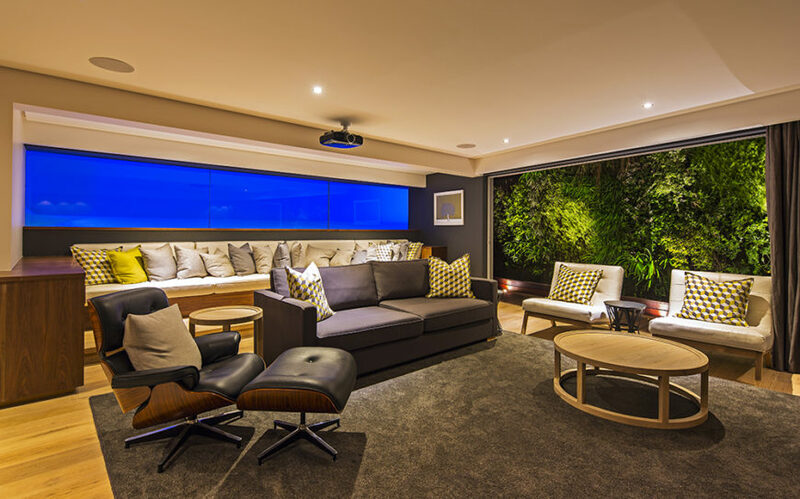 Massive sliding glass panels cover nearly every room, opening to blur the line between indoors and out. These broad openings are framed in sleek natural wood, stone, and cool steel elements that retain a timeless look even while styled distinctly modern. Moving inside, we see a vast floor plan with interconnected spaces across a completely open layout. Each of the major social spaces bleeds into one another, while the bedrooms are kept more private. 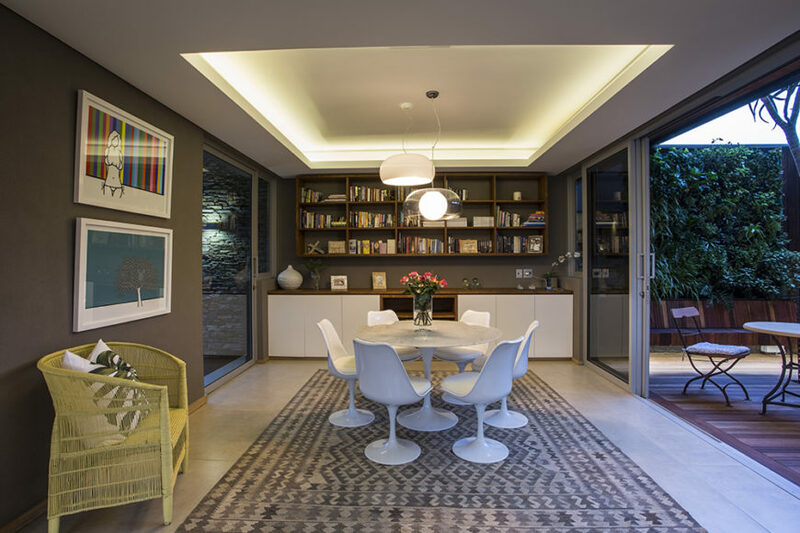 The lower level areas all open completely to the outdoors, expanding their usable space and offering expansive vistas and fresh air to those even deep in the house. Each major area of the home is defined by a stylistic element, whether it’s light natural wood panels, sleek white cabinetry, stone features, a burst of color, or otherwise. The entire home is connected by a cohesive design filled with sharp edges, exposed elements, and natural lighting. With subtle embedded lighting throughout the home, every innovative surface and interesting piece of furniture has been highlighted perfectly. 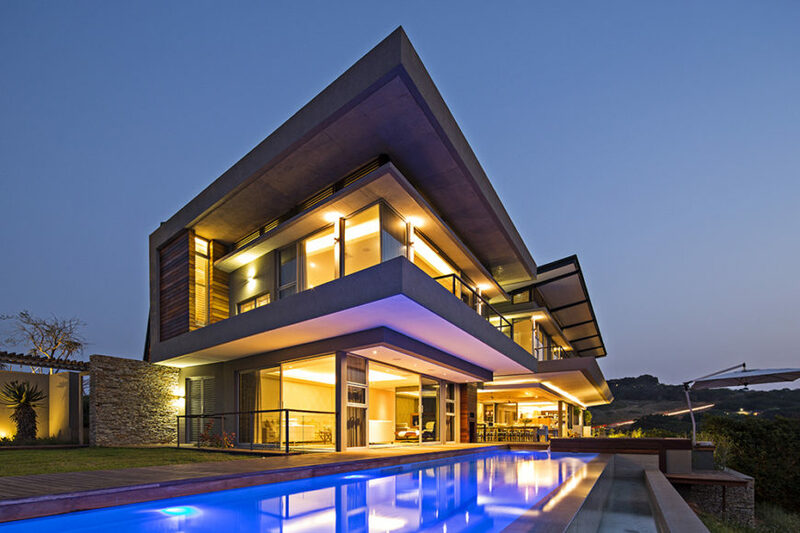 The startling mixture of timeless materials and cutting edge design makes for a truly unique home. 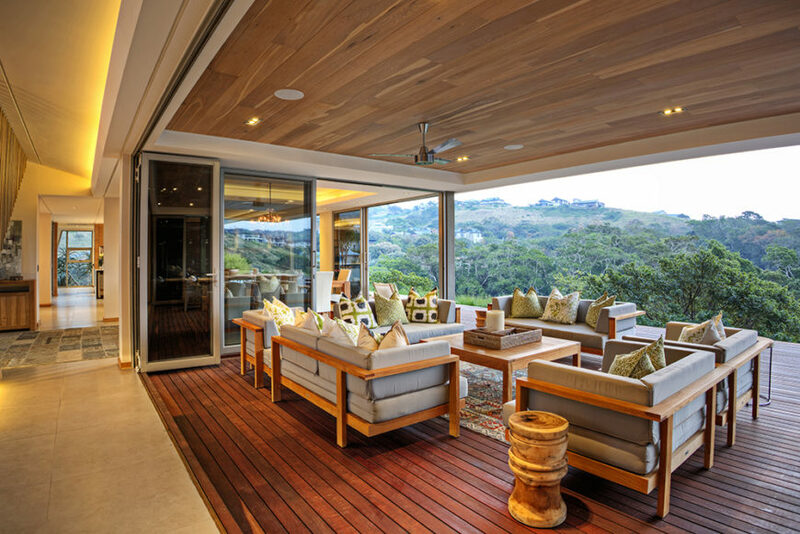 We begin just outside the home on the extensive rear patio, awash in rich natural wood panels. 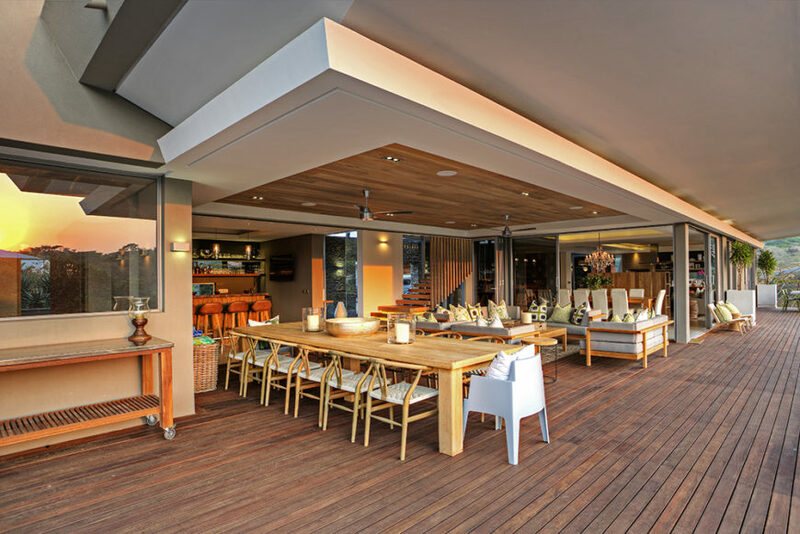 Here, the outdoors blends with the interior in a large dining and relaxing space. 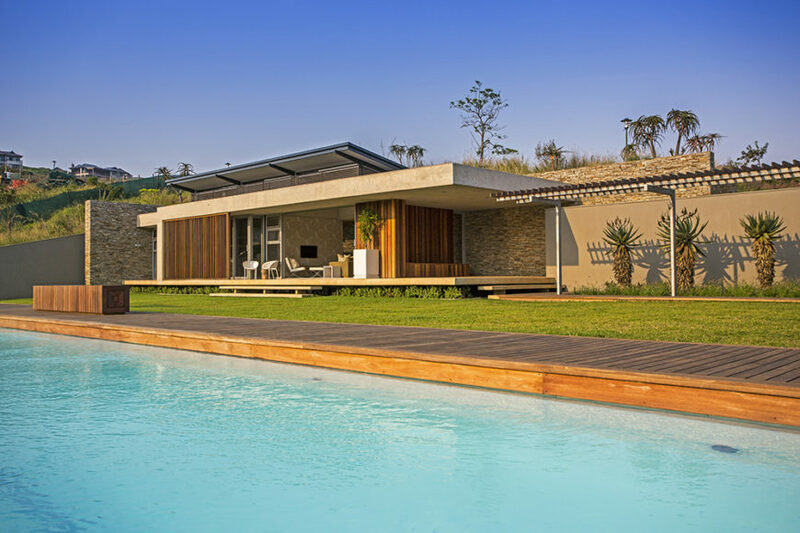 With the folding glass panels fully retracted, the interior meshes perfectly with this outdoors space, protected from the elements by a large overhang and filled with comfortable furniture. 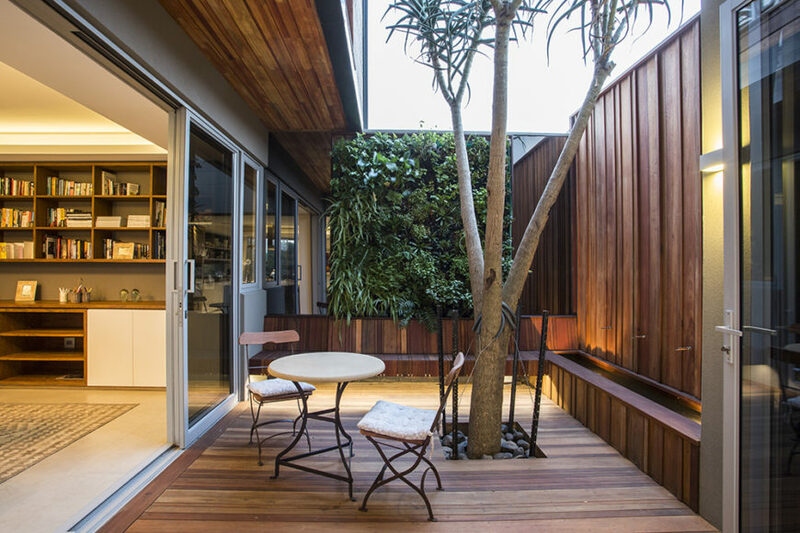 Many rooms throughout the home connect directly to the deck, including this cozy, private space with a tree growing through it. 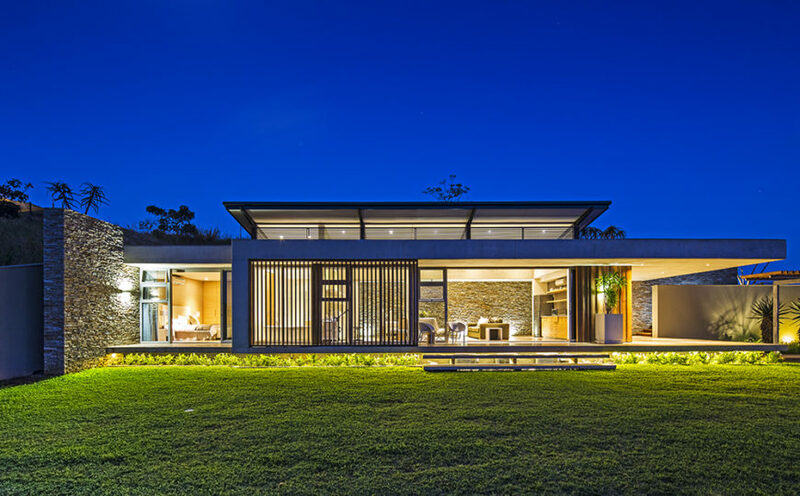 Glass panels and large door openings blur the lines between indoors and out. Here’s the cozy dining space just inside from the patio seen above. The room is flush with artwork, shelving, and innovative lighting tucked into the raised ceiling. 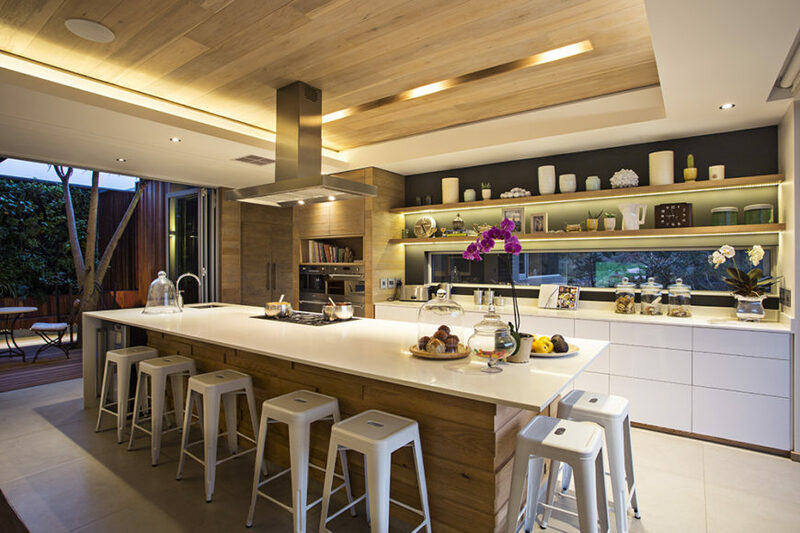 The kitchen sits within a vast open space area, defined by its large island and use of bright natural wood tones. The island features a built-in oven, range, sink, and space for dining. The kitchen also boasts sleek, hardware-less white cabinetry and intricate built-in shelving. 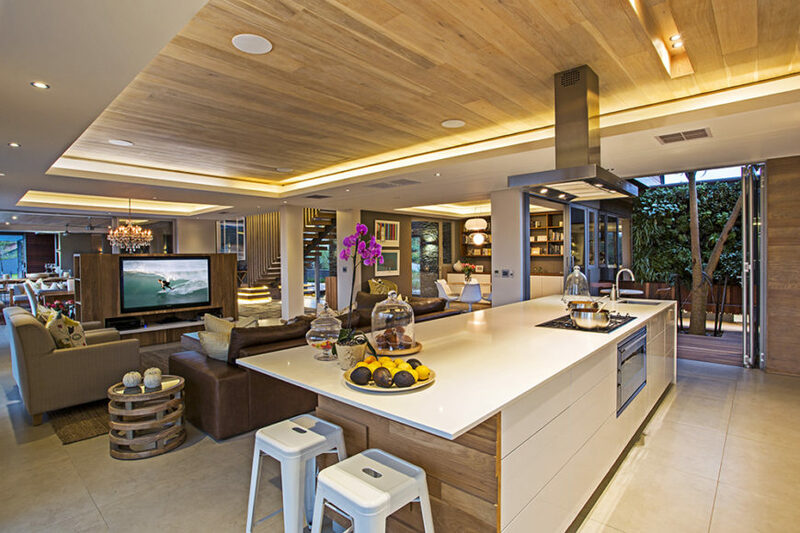 The natural wood panels wrap the island, pantry to the left, and span the ceiling. 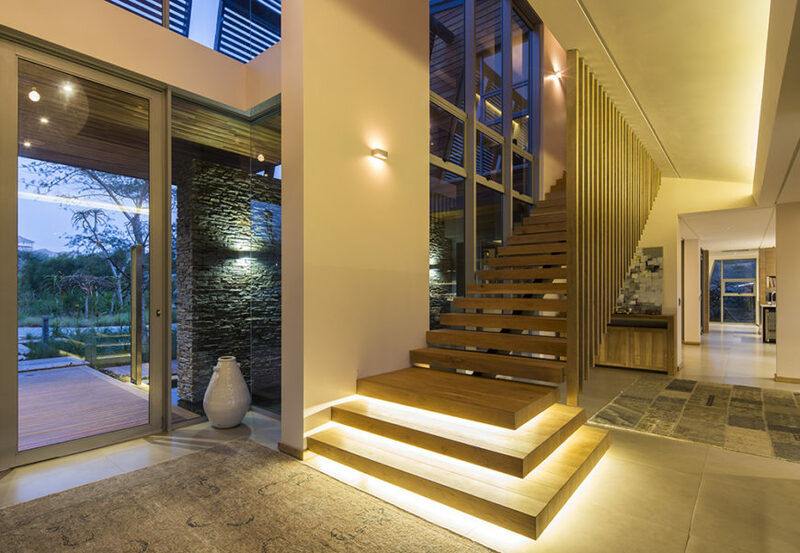 Here at the main entry to the home, we see open design staircase leading toward the bedroom areas, with built-in lighting beneath the steps. The front entry is all steel and glass, framed in stone. 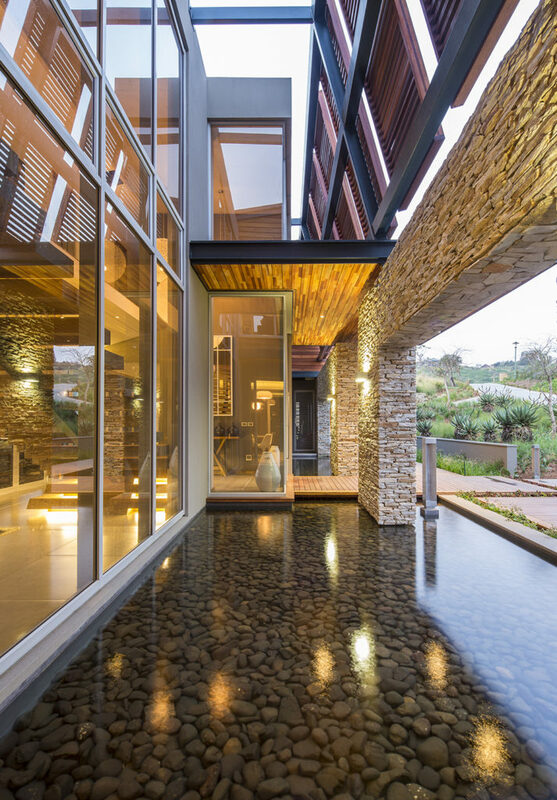 Just outside the main entry, we see a stone-bottom pond that flanks the wooden entry bridge, overlooked by massive glass panels on the home. Above, wooden louvered panels grant privacy and shade to the upper levels. Moving up the stairs, we can see down into the main entryway and living room area from the catwalk with glass balustrade. Artwork spans the vast white walls on this floor, naturally lit via huge glass panels on the front. 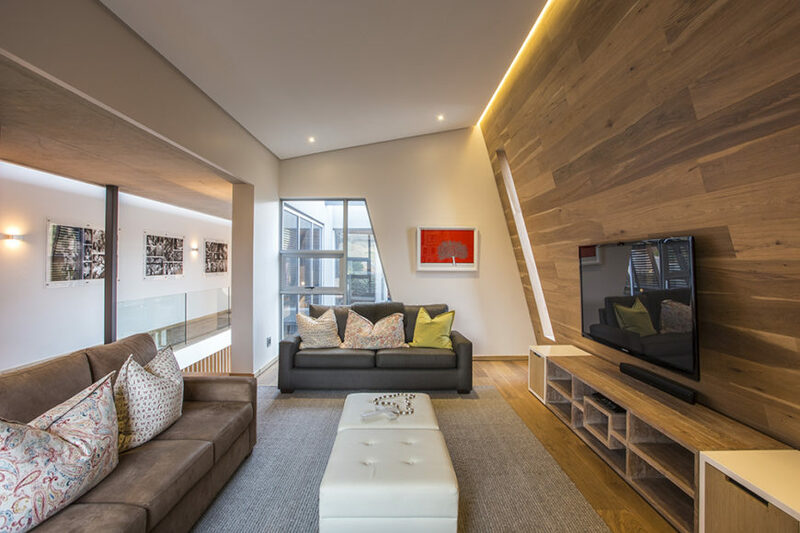 On the upper floor, we see an angular-shaped smaller living room area that flanks the entry space. Here, sleek wood paneling covers the wall and floors, while broad openings allow for views outdoors and throughout the interior of the home. The master bedroom is a luxurious suite, combining several major elements over a layered floor plan. 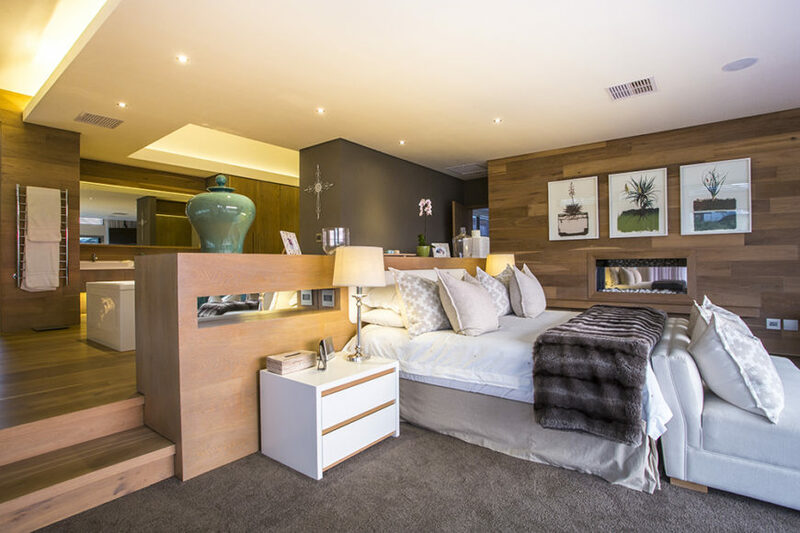 The bed area sits lowest, near sliding glass doors that access the balcony, while an en suite bathroom sits on a raised wood area. The bedroom boasts a completely open bathroom design, with a large jacuzzi tub at center. The room also houses the full vanity, toilet area, and an extensive closet space. 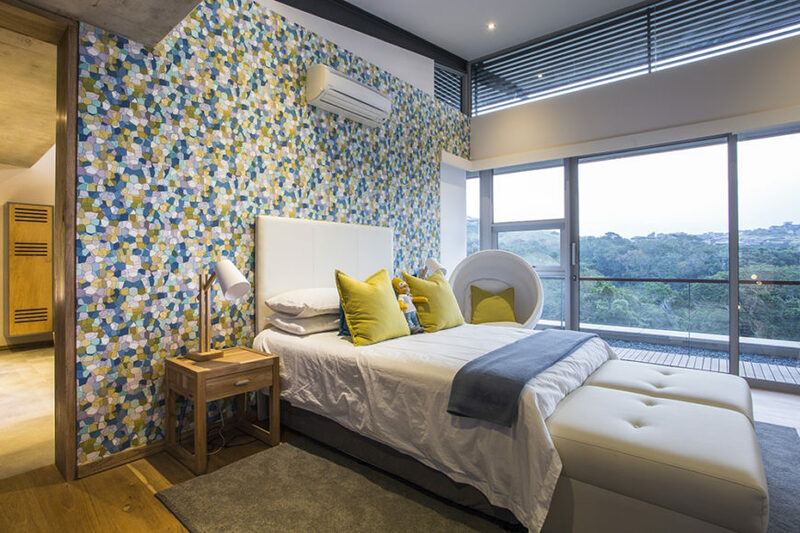 Here’s a secondary bedroom, awash in bright colors thanks to a patterned feature wall. To the right, we can see the full height glass sliding panels that allow for breathtaking views and direct balcony access. Moving to the lower level of the house, we see more hardwood flooring, natural wood cabinetry, and an intriguing glass divider wall with laser etched tree designs. On this level we see another large living room space, with a lengthy sectional against the back wall and set of midcentury modern chairs in the foreground. To the right, another vast window offers views of the environment. Within the numerous private and social spaces of the home, we see direct and broad access to the outdoors via sliding glass panels. 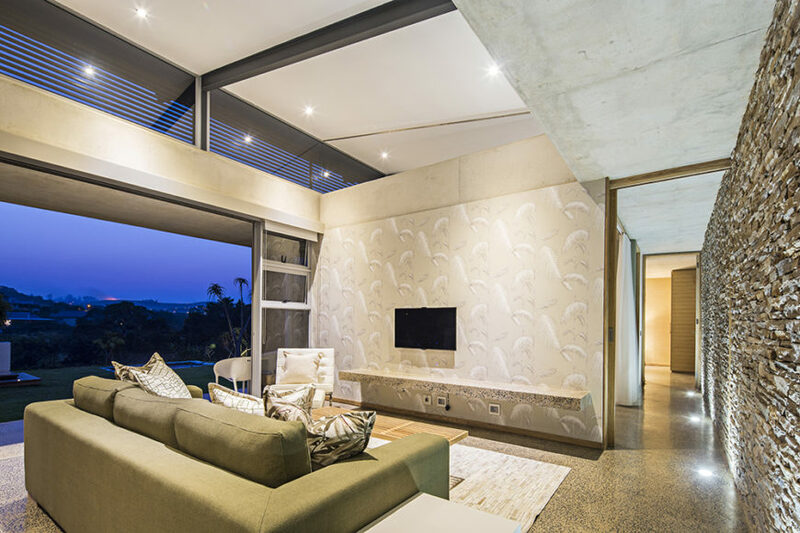 Here, a stone wall connects all of the various rooms in the open plan design. Moving to the expansive backyard, we see a minimalist landscape with lengthy pool to the right, wrapped in more sleek wood flooring. The building itself features numerous natural wood louvers for shade and privacy. Seen from across the back lawn, the home positively glows from within. We can see right through to the interior, courtesy of those massive glass panels. Over the cool waters of the pool, we see how the rich wood deck mimics the look of the wood found wrapped around the home itself, appearing on the deck, feature walls, and louvers. 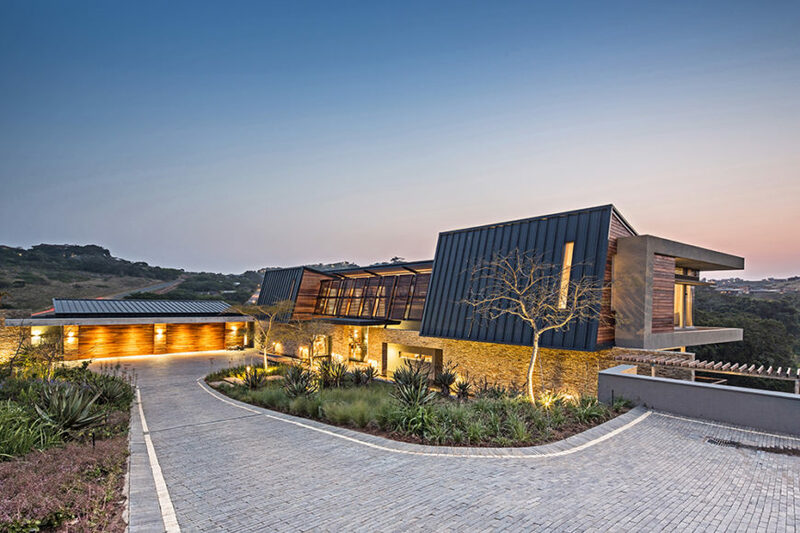 From a distance, we can see the intricate layering of the home’s construction, with an angled steel roof raised above the stone and natural wood structure. Finally, we see the approach of the front entryway. From here, the home enjoys a modicum of privacy, but also feels open and inviting. The brick driveway offers a sloped approach to the home, which glows at night via subtle exterior lights. From here we can see the vast landscape that the building overlooks.